There used to be a time when I thought, how do business owners, particularly small business owners, find the time to write blog posts? It seemed to me an impossible task to be able to write something fresh and new every week, let alone every day as some recommended. Now having been in the marketing industry for a while, I understand how it’s done. I’m sure there were (and still are) many small business owners who felt just like me – it’s an impossible task, so I’m not going to even try and write a blog. And what will it really do for me anyway? 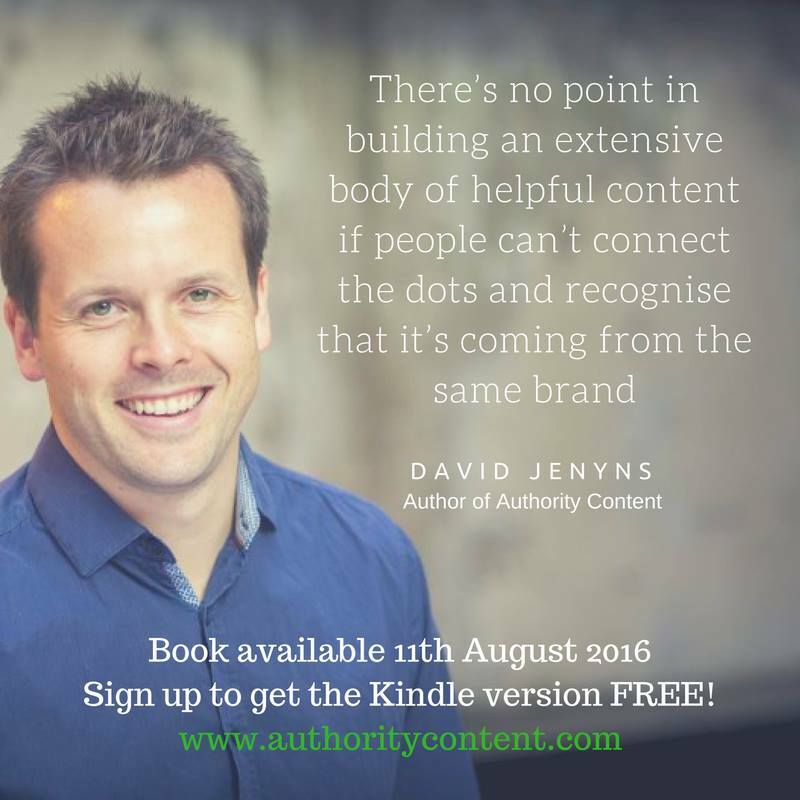 In his new book Authority Content, being released on August 11, @DavidJenyns reveals why having content – not just any content but useful, thoughtful, authority content – is a critical piece of the marketing pie for any business that wants to survive and thrive. 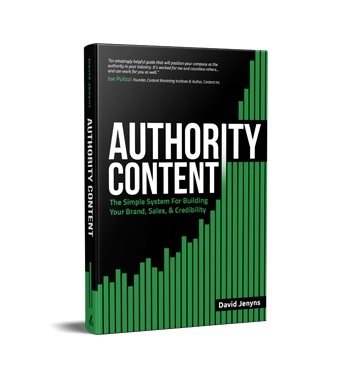 Below is an exclusive release of Chapter 14 from David’s book, ‘Content Repurposing’, where we discover 5 techniques to make it easy for business owners to position themselves as an authority in their marketplace. Read and enjoy! Do you know the story of the hunting tribes who when they kill an animal use every part – the meat, the bones, the skin? They waste nothing and, in doing so, maximise the benefits from the hard work they put in to tracking and catching the animal. Authority Content is just like that, except with less gore and a much smaller chance of being eaten by a lion. After all the effort you’ve put into preparing and hosting a workshop, you’ve extended the benefits of that work for a further three to six months by turning the workshop into videos, photos, articles, and social media content. That in itself would be impressive, but there’s no reason you have to stop there. You can continue to repurpose this content to create amazing additional content that will attract people to your website and your business. How? Here are five more ideas to give you a hint of what I mean. Hang on, didn’t Google say guest blogging as an SEO strategy is dead? It’s funny how often I hear this and it’s not just limited to guest posts. At some point just about all strategies have been deemed “dead”. So, what gives? If CNN.com came to me and asked me to comment on an area where I’m considered an expert, I’m not going to say, “No thanks, guest blogging is dead.” Great high quality content, placed on quality sites that your audience visits, will never die as a strategy! So, we’ve already created blog posts that are essentially a video with the accompanying transcripts of the video. The next level in this process is to spin the transcript into a stand-alone article. By “spin”, I don’t mean passing the transcript through article-spinning software and creating a nonsensical collection of words that no one will want to read. I mean hire a writer to produce a well-crafted article that is based on the content in the transcript. In fact, a skilful writer will probably be able to produce multiple articles from a single video transcript. Although the teaching points may be the same as those contained in the video and the transcript, the content is most definitely unique and can be used on your blog, on social media sites and especially in guest-posting opportunities. Find high-profile bloggers in your space, with a strong readership, who rarely post guest articles and try to come to some kind of arrangement. This step is even easier if you begin with the experts and businesses that contributed or partnered with you at your workshop. You can get buy-in for this approach if you create articles based on the content that the experts themselves delivered at your event and invite them to use the article in their own name. As long as the guest post references your event and includes a backlink somewhere, everybody wins. Yes, I know, I know… press releases are dead! Well, that’s true if we’re talking about spamming out press releases to the four corners of the Web through delivery services that do little more than clog up the email inboxes of journalists. But we can still use a couple of services and get great results. Like everything these days, the secret is putting out great quality content. There’s the dual benefit of both SEO and more importantly, building long-term contact lists of industry-relevant journalists. Almost every industry has its own print and online magazines and the journalists who work for them are almost always crying out for help in finding new, interesting and relevant stories. Many of these sites will have some kind of onsite press release submission service, but it always helps if you can take the time to talk to and get to the know the journalists personally, either by telephone or by arranging a meeting at an industry event. You can even invite them to cover your future events. Even if the release doesn’t get any major traction but does find its way into news items somewhere online, this can result in a handy boost for the popularity of the video. Again, be selective. With this approach one or two press releases every few months is plenty and forces you to focus only on your most popular and potentially-newsworthy content. Infographics, if you’re not familiar with them, are large images (usually long and narrow so they fit nicely into a blog post) that are made up of a series of interesting facts, and often statistics, and presented in a visually interesting way. Faster to read than an article and frequently more memorable, the best ones get shared again and again on social media and blogs. Not every video you produce will translate well into an infographic, so be selective. Take a handful of your biggest and most important ideas and tips, organise them into a simple list or chart, and then hire a top-notch graphic designer to create something beautiful. Slide Share sites are a popular way to share slide decks from PowerPoint or Keynote style presentations. They sit comfortably in the middle ground between the visual appeal of videos and the speed of accessibility provided by written content. You already have the slides that you created for your workshop, so it’s simply a case of chopping them up into portions (in a similar fashion to time-coding the video) and perhaps adding some additional explanatory text. How about this for another idea? Video files are very easy to turn into audio files. From that point, there’s nothing to stop you putting them online, in sequence, as a podcast. You’ll need to chop up the workshop video a little differently – using larger chunks, and keeping everything in logical order – but this is a great way to reach a very large and potentially new audience. Since the podcast will contain, in all likelihood, the bulk of your workshop content, you may want to wait until your content has aged a bit so it doesn’t interfere with, for example, your YouTube campaigns and any product sales you have going on. Curious to see what one of these podcasts look like? What do all of the ideas in this list have in common, aside from the fact that I’ve been able to use all of these approaches to great effect? The answer is that I came up with ideas simply by visiting a site that permits user-generated content and adapting my workshop video content into a new format that is suitable for the platform. Tailor your content to the platform and link back to either your site, a relevant YouTube video or one of your social media pages. Back in the day, SEO practitioners used to obsess over things like “feeder sites” and separating different linking sites into specific hubs, but there’s really no longer any need for that. We actually want Google to know that all of our content is linked together, that we’re creating tons of great material and that people are loving and interacting with our videos, articles, social media pages, infographics, slideshows and everything else we’re putting out there. The only rule for this ever-increasing range of content we’re distributing, one that has never changed, is that ultimately the content should always lead people back to the main site. Each piece of content should be part of a breadcrumb trail that, if followed, will eventually bring people to the cake – your website. I hope you got the message earlier. When someone calls out that a strategy is dead, what this person usually means, is that spamming this technique to create backlinks and generate better search engine rankings is no longer working. This is usually because Google has tweaked its algorithm to stop people taking advantage of a loophole that results in a glut of poor quality content. But if your content is good quality, posted manually with accurate titles and descriptions, in a location that is visited by real people – all of which should be true if you’re following the Authority Content system properly – there’s no reason why it shouldn’t still work for you. Even if its ability to improve your search engine rankings has reduced, as long as it’s helping potential customers learn more about you and your business and find their way to your site, there’s no reason why you shouldn’t keep going. So, simply find social media sites, content sharing sites and other industry blogs that are currently popular – or growing in popularity – and create content that is tailored specifically for that venue. Keep spinning that workshop content into an ever-growing arsenal of great content. Also, a word to set realistic expectations here… not every piece of content you share will go viral. Some of that content will generate no interest, some will generate a little interest and some will generate a lot of interest. The secret is consistency and every now and again, you’ll hit a home run with a single video, article, infographic and it will generate tens of thousands of views. Keep producing content in a consistent and considered fashion, keep SEOing it like you would any bit of content on your site and you’ll do just fine. When you do hit a home run, remember to make the most of it! As I said, occasionally you’ll have a piece of content that gets x5, x10 or even x100 the amount of views and engagement as everything else. Often it’s hard to know exactly why… maybe you hit a sweet spot with the subject matter, maybe you selected a great keyword or maybe an influencer shared it? Most likely it’ll be a combination of a whole range of factors. So, what do you do now to get the maximum exposure? A great strategy is to further amplify its success through paid channels. Depending on the type of content, you will have a variety of options. For example, a YouTube video can be promoted through with pre-roll advertisements. Images can be advertised through Pinterest’s promoted pins. Guest posts, and/or your own blog posts, can be boosted through Facebook’s ad manager. There are many options and my goal is to not to list every possibility but rather get you in the right mindset. The strategy of creating content and promoting your best bits through paid channels works a treat – and to take it one step further, you can then build remarketing lists from this audience for future promotions. Unless your business is, in fact, in the rocket science industry, in which case it’s not exactly brain surgery. Remarketing is a method of advertising to those who have visited your website or viewed your content. Previous visitors or users can see your ads as they browse the internet through the Google Display Network, YouTube, Facebook and other channels that offer this service.